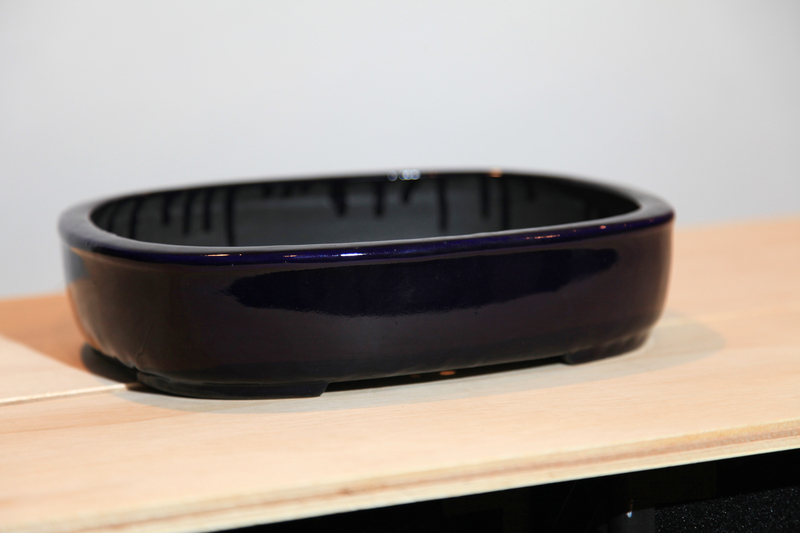 I (intentionally) haven’t talked about pots on the blog yet because I didn’t know anything about them. Most of the trees I’ve bought have come with generic pots, or the pots I’ve purchased have been budget pots. Up until now my motivation for buying pots has been based purely on utility, mainly as just something my tree can sit in while it grows. I’ve slowly moved most of my trees from their nursery pots to either cheap garden store clay pots or wooden boxes of my own construction. But as my collection grows, and specifically during the winter when there is nothing else to do, I’ve taken a strong interest in nicer pots. This past Christmas season (combining my birthday and Christmas in a single week) I received a pretty good amount of money in gift cards and cash, so I decided that having the funds and the time, it might be the perfect opportunity to acquire some nice pots. When you look across the internet, both domestically and abroad, you’ll find a variety of pots from a variety of artists and companies. So which ones should you buy? How much should you pay? And how do you know that what you think you are getting is actually what you are getting? And the age old question (I guess?) do I buy a pot for one of my trees, or buy a pot I like and find a tree for it? Or do I put a tree in it at all? Do I just like pots? Do I even like bonsai at all? HA! Of course I do! All of these are valid questions, and as always, I won’t have an answer for you. But what I can do is tell you about what I’ve been into lately and maybe you can find an answer buried in there for yourself. In my mind there is really only one place to start, if like me, you know absolutely nothing about pots. Ryan Bell. If you speak English as your primary language Ryan’s blog is really the only place I would even think about starting to get information about bonsai pots. And that’s what I did. Over the past couple weeks I’ve read every post, from the first to the last, on his blog. Ryan’s posts are not idiot proof, and he essentially starts writing from where he’s at (at the time of the first post, about a year and a half into pot collecting). So in reading there will probably be quite a few names or terms that you’re not familiar with. But that is sort of the point in my opinion. If you didn’t have to actively work for a little knowledge, what would be the point of knowing it? If you don’t get it, read it again, and again, and look for more information, or even better, e-mail Ryan. He’s a really nice, informed, and helpful guy. After spending the time to read through his blog, you’ll find that you have a fairly solid idea of what you like in a pot, and what you dislike in a pot. You will probably know which artists or kilns produce your favorite work, or pots that work best with a certain species of tree, And you’ll even have a rough (probably very rough) idea of whether the price tag is worth it. This is an awesome way to start and like anything in bonsai, the only way you’ll develop an eye for it is by seeing as many examples as possible. Over the next couple of weeks I’ll be posting the pots I purchased as they come in from Japan. Hopefully I’ll be able to give you a little background on each. The first pot in the line up is a “Koyo”. Sometimes you will see this as “Kouyou”, “Aiba Koyo”, or in the founder’s name “Aiba Kouichirou.” A great compilation on Koyo can be found at Nebari Bonsai, including a brief bio from “Potterie Du Monde” and a photo gallery from Ryan on the “Evolution of Oribe” a type of glaze Koyo is known for. There are a few things to notice about this pot. First of all let’s take a look at the hanko. 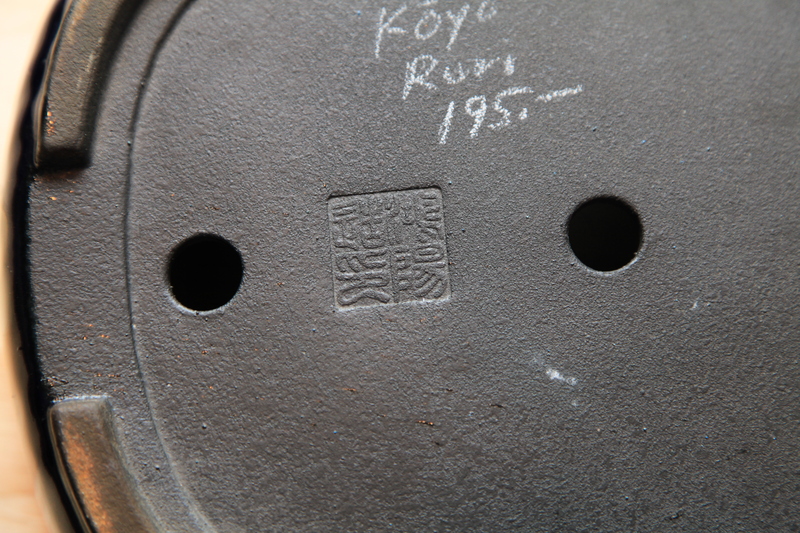 The hanko (also referred to as the rakkan, chop, stamp, seal, etc…) is usually located on the bottom of the pot. Different artists and kilns use a variety of methods for marking their pots, but generally the mark is imprinted, scratched in, or painted on. The hanko can represent different things depending on the artist, but more than likely they indicate either the artist, the kiln, the location it was made, or collection it is a part of. Some artists change their hanko over time, so knowledge of that evolution can help you date the pot and establish its value. Ryan has spent a good deal of time putting together one of the largest hanko databases around, which is especially helpful if you don’t read Japanese (or Chinese for that matter). 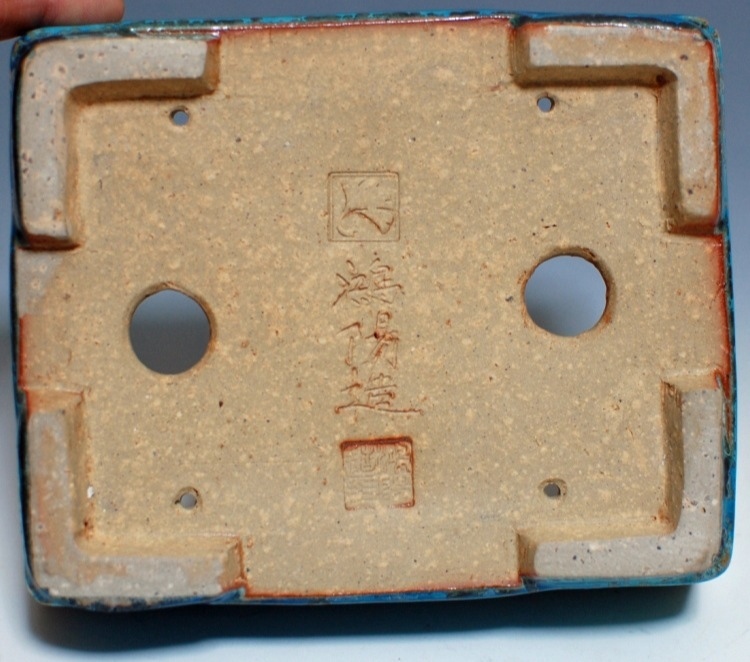 This first pot bares (what I understand to be) the standard Koyo hanko. It is one of the production line series, and as such is likely the least expensive of the Koyo pots. The thing I really like about this pot (aside from being relatively inexpensive for its size) is the fact that the clay is nearly black. 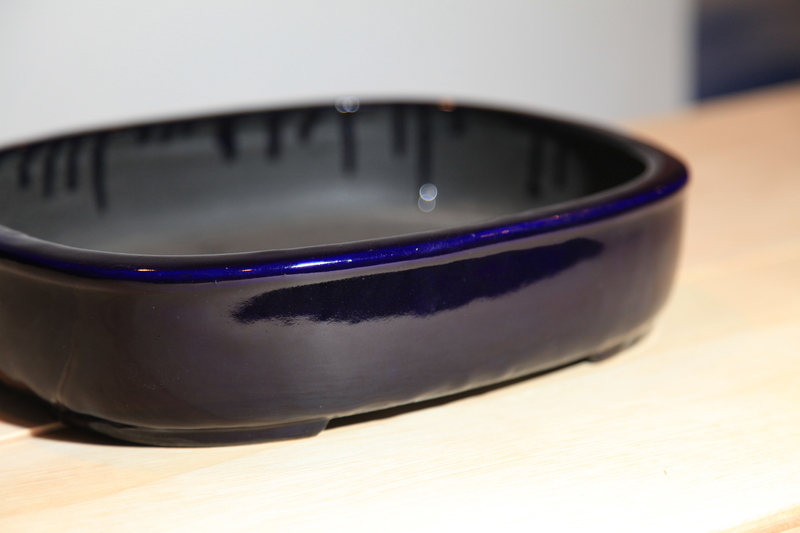 The glaze is a transparent blue which is hard to notice until you shine a light on it and see that it’s really the clay’s color that makes the glaze look so dark. The glaze also has micro bubbles and some pooling around the bottom which gives the rim between the legs a wavy appearance. The second most valuable Koyo pots bare the arch stamp and I understand they are made at Koyo’s home kiln. I will have two of these to show in the next couple of posts. The third and most valuable type of Koyo pot bares the Koyo Hanko, Japanese fan stamp, and Aiba’s hand engraved signature between them. A great example can be found at the Nebari bonsai post I mention earlier. This entry was posted in Bonsai Pots, Uncategorized and tagged Aiba Kouichirou, bonsai pots, Ryan Bell. Bookmark the permalink. Hi there Sir. You mention in your blog that you purchase Bonsai’s. May I ask who your source is and where do you buy from. I have seen a seller from E bay from the Leicester Area. What would you recommend and what about the material for Wiring. Just place an order of Bonsai Inspirations by Harry Harrington. I bought around 10 pots while in Japan…but nothing too special…did not know much about pots. Some are even without stumps, but I like them. I am getting infected with the pot mania. Enjoyed your post a lot. Cool, the pot bug is infectious 🙂 and liking the pots you buy is the most important part, though knowing about them is fun too. Many of the older pots were unstamped, especially from China. Maybe you have some gems! Pot: good info about pots.